We parked in a lay-by on Patterdown and walked back down to where the road crosses the brook. The land to the left of the brook had been cleared; nettles and other plants were cut back to ground level. 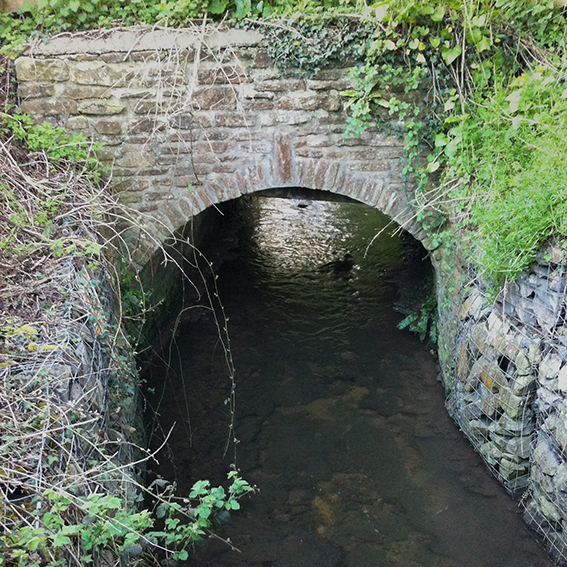 The bridge looked modern; it was built mainly of Bath stone with a wooden fence on top. The banks of the brook had been reinforced with stone, creating a smooth curve. We watched a mallard swimming against the current then crossed the road. Here there were a few houses surrounded by tarmac drives and borders. After the road bridge there was a second bridge, faced with stone, connecting one of the properties to the wood on the other side. This area was unmanaged, overgrown with trees and bright green spring plants. As we made our way through low branches and nettles we could see the slightly darker line in the undergrowth which marked the course of the brook before it disappeared into a thicket of young trees; beyond lay the point where it emerged from under the embankment. The railway line was high above and throughout the evening trains rattled by. A man came out to check his car. We were aware that though not trespassing we were close to boundaries, so we returned to the road and continued past the houses keeping the railway line and brook on our right. 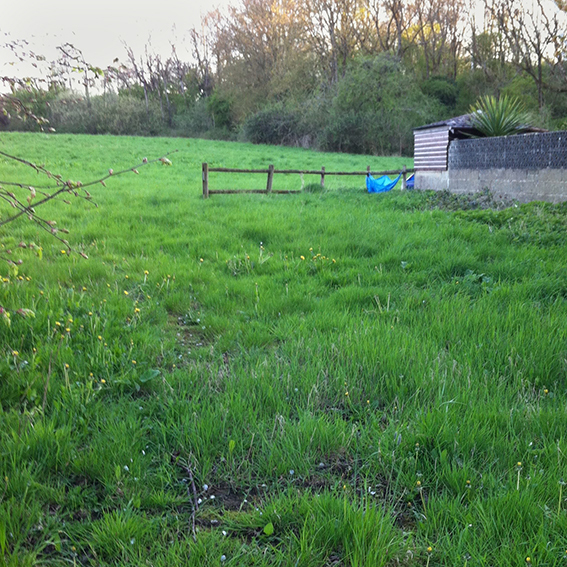 We came to a sign erected in the grass verge advertising houses for sale – here the land was up for development and we climbed over a low metal fence into a field which undulated down towards the bottom of the embankment (1). We were near the top of the slope and the ground beneath our feet was uneven. It felt neglected. There were flattened trails left by animals and dry mud scrapes punctuated by larger tussocks of thick stemmed grass. Lady’s smock flourished in the damper parts, bushes grew haphazardly and there were small thickets of trees. One of the tracks led up to a group of trees which clustered around a small pond, keeping the light out and creating a dark hollow even with their leafless branches. We looked across to the railway line with trees running right to the top of the embankment; somewhere down there the Pudding Brook emerged. From our high vantage point we could see the fringes of Chippenham on the plain leading down to the River Avon. We walked down and ducked under some trees growing around a low-lying pool of water, then we followed an animal track up and down a series of folds in the land below the embankment. Mature trees grew all around and in some areas the ground flattened out for a bit. There were primroses in the short grass and sapling trees too. The light shone down from above the railway line. We dropped to the lowest part which was boggy and brown with leaf mould, rusted metal parts poking up from the ground. Ahead of us was a barbed wire fence, beyond which we could see the shiny bars of new barriers either side of a brick built tunnel set into the bank: and there was the Pudding Brook flowing out of the tunnel. It appeared to be following its true course but the banks had been fortified and once it curved out it followed a straight line heading for the bridge where we had been standing earlier. Leaning over the barbed wire fence we could see through the tunnel which ran under the railway line far above, and in the distance – a gleam of light at the other end. It was too dark to explore further so we made our way back to the car in the lay-by. Road bridge over the Pudding Brook. This bridge was used for geocaching but the cache has now lapsed. Bridge over the Pudding Brook connecting private gardens with adjoining woodland. The lower end of the field between the road and the railway embankment. The line of trees and shrubs marks the course of the Pudding Brook. The lowest part of the field. The Pudding Brook emerging from the embankment. The tunnel which takes the Pudding Brook under the railway line.